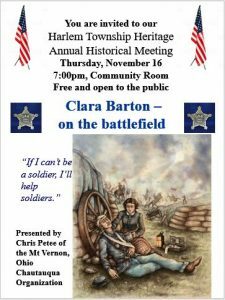 November is coming again and as it has been for the past several years, Harlem Township Heritage is once again planning an historical meeting and inviting members of local area historical groups and others to come join us. in the Community Room behind the Harlem Township Firehouse at 3883 S. St. Rt. 605, Galena. Delaware County Historical Society Board, Staff, and Volunteers, if you plan to come to this meeting, please email Susan Logan so we can be recognized as a group.